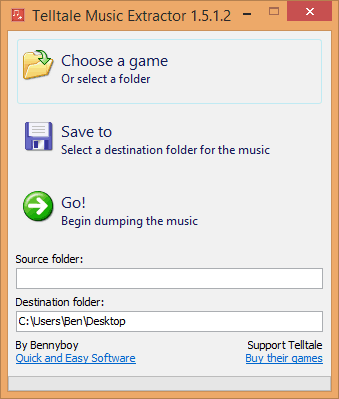 As promised, I’ve updated Telltale Music Extractor; it now supports Game of Thrones Episodes 2-5, Tales From The Borderlands Episodes 2-5 and Minecraft: Story Mode Episodes 1 and 2. I’ve also fixed the problems with missing music in Game of Thrones. In practice this meant that I had to switch languages to C++ and write a custom .bank file dumper. This was a huge pain, but it does mean that all music is now dumped. The complexity of the new dumping system may mean that I’ve made some mistakes so please let me know if you think its not dumping all the music from Game of Thrones or Minecraft. Also please be aware that dumping from these games requires a lot of space and takes a long time – the music is dumped as uncompressed wav’s and will take up at least 4GB of space. There are a few more things to watch out for, see the readme for more information. [Edit] – I know the dumping for Game of Thrones and Minecraft is still a bit wonky – I think I’ve found an even better way of dumping from these games but it’ll take a few days to test. [Edit 2] – Fixed in the latest version. Thanks for the space warning! I would’ve dumped this to the wrong drive if I hadn’t seen that! I’ve only tested this on Episode 5 of Tales from the Borderlands (Steam Release, game files copied to C: library from preferred E: Library to be detected by the tool), but so far, the experience is completely identical to v1.5.1.3; the tool’s window goes into a waiting loop or not responding state after 20%-25% of the loading bar (Although extracting to a USB external may be a cause for this), but the extraction continues & completes successfully with 2299 files retrieved in MP3 format. Does the extraction in uncompressed WAV only occur for Game of Thrones & Minecraft: Story Mode (Presumably due to engine/archive changes I’m guessing TotB didn’t receive), or is something not occurring as intended? Tales from the Borderland uses the older music system so doesn’t have the problems that the other two games do. Music from TFTB will dump correctly without any conversion to wav. Lovely! Thanks for the clarification. Blaze – try the new version I released earlier today.